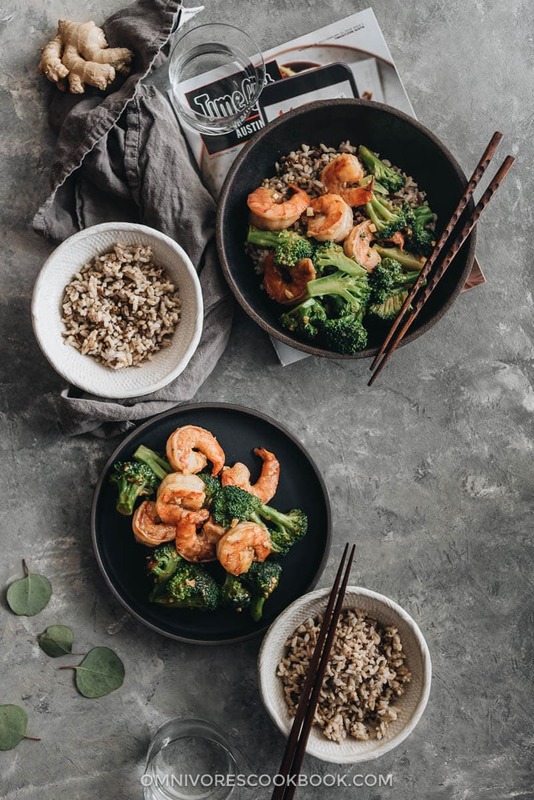 Garlic shrimp and broccoli is one of my favorite weekday dinner dishes, because it is so fast to prepare, loaded with lean protein and veggies, and extra delicious. 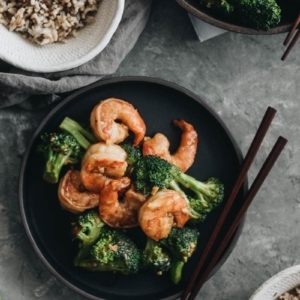 All you need is shrimp, broccoli, garlic, and a super easy sauce made with 5 common ingredients. 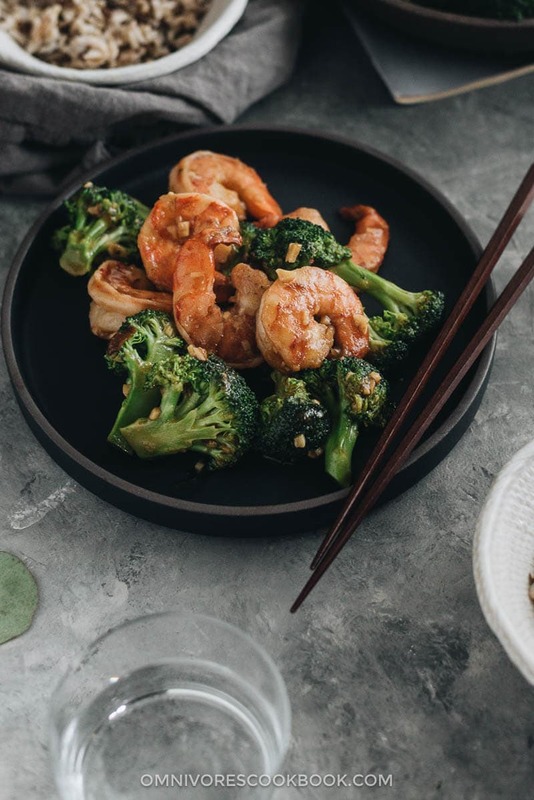 To create extra tender shrimp with a nice aroma, I use a Shaoxing wine and cornstarch slurry to marinate the shrimp for 5 minutes. It’s a Chinese cooking trick that my mom never skips. 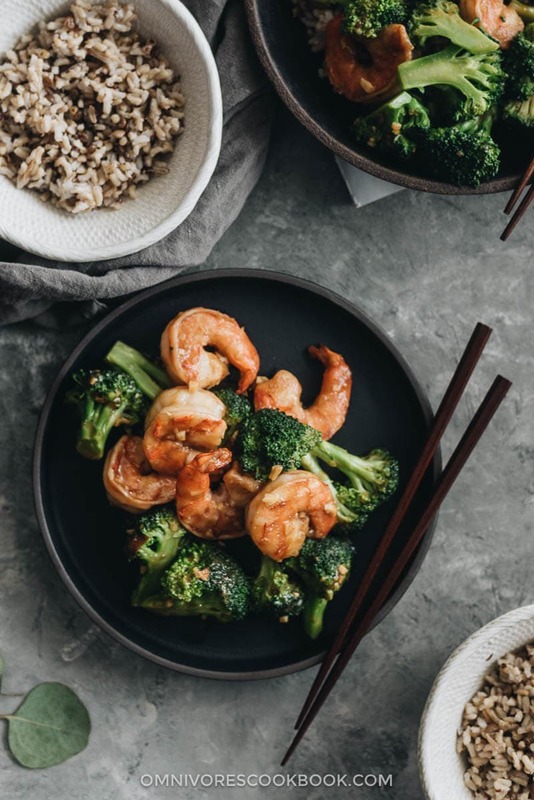 When you coat the shrimp with cornstarch, it protects the shrimp from the hot pan so you won’t overcook them, and it adds a bit of a crispy texture on the surface. So you can use a nonstick skillet instead of cast iron pan to make perfect juicy shrimp with a beautiful char. The wine adds fragrance and a slightly sweet taste. I highly recommend adding ginger as the recipe suggests, since it goes great with shrimp. But you can skip it if you don’t have any on hand. 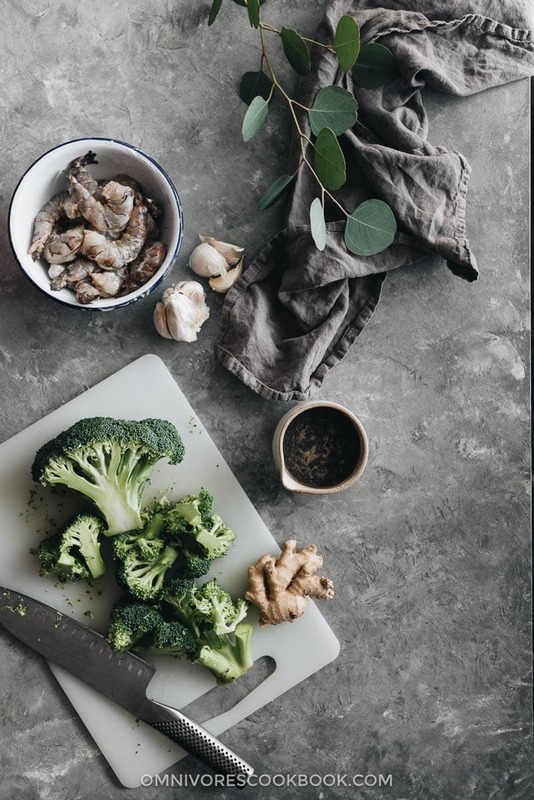 To eliminate the extra pan to blanch the broccoli, I use a quick steaming method using the same skillet you cook the stir fry in. Simply boil a bit of water in the skillet and cook the broccoli florets, covered. They will be ready in a minute or so. Isn’t it super convenient? I usually serve it on top of steamed rice to make a full meal. 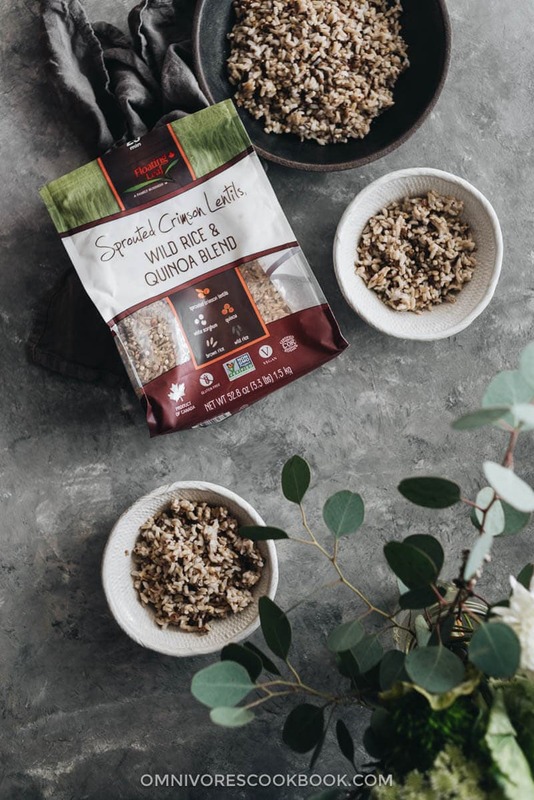 Lately, I discovered a great multigrain blend from Costco, containing lentils, sorghum, quinoa, brown rice and wild rice. It has a nice chewy texture and is super healthy. It takes longer to cook, so I usually cook a big batch on the weekend and serve it during the week. Combine all the marinade ingredients in a bowl. Mix well until the shrimp are evenly coated with a layer of slurry. Whisk all the sauce ingredients together in a small bowl and set aside. Heat 1/4 cup water in a large nonstick skillet over medium high heat until boiling. Spread the broccoli in the skillet. Cooked covered for 1 minute or so, until the broccoli is mostly cooked through. Transfer to a plate. Wipe the pan with a few layers of paper towel held in a pair of tongs to remove the extra water, if needed. Add the oil and spread the shrimp in one layer in the skillet. Let cook for 30 seconds without moving. Cook and stir occasionally until the bottom turns golden. Flip to cook the other side until golden. Add the garlic and minced ginger. Stir a few times to release the fragrance. Add the cooked broccoli back into the skillet. Stir the sauce again to dissolve the cornstarch completely. Pour sauce into the pan. Stir to mix well, until the sauce thickens. Immediately transfer everything to a plate. Serve hot over steamed rice or noodles as a main dish. Hi Maggie thank you fir sharing all the delicious recipes. I am going to try the garlic shrimp and broccoli. My husband loves Chinese food. Thank you very much Maggie. Hi Connie, I have quite a few fried rice recipes. If you want to get that nice smoky taste from the restaurant, you need to use a wok.